Upon first reading the summary for Things to Come, I had a sense of predictability. Here we have Nathalie, a high-school philosophy teacher who seems to have all her ducks in a row. She has a job she’s passionate about, a happy marriage of 25 years, and two wonderful children who are growing up and fleeing the nest. Even if I stopped right there, your guess on what was coming next would be pretty accurate. You guessed it – Nathalie’s world is thrown for a loop when her husband announces he is leaving her for another woman. I was rolling my eyes at this point. Hello! I’ve seen this plot before. 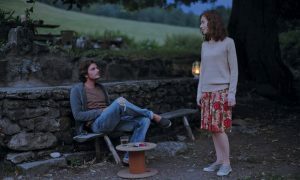 Then, when director Mia Hansen-Love introduces Fabien, one of Nathalie’s favorite former students, my Hollywood-trained mind thought we had the entire movie figured out. As Amanda mentioned, the films we show at the Knickerbocker are not the mainstream, predictable movies many of us are used to. Foreign films, like Things to Come, don’t follow any kind of cookie cutter plot – they do their own thing, keeping viewers engaged with original content and story lines. So no, we don’t see Nathalie meltdown, pursing a relationship with a younger man who reminds her of herself in her younger years. Instead, we see a woman of intellectual and emotional substance find new freedoms and understanding in her new life circumstances. Honestly, how could you not appreciate Hansen-Love’s fresh perspective in this kind of crisis? Plus, the divorce isn’t the only turbulence in Nathalie’s life, but she faces each with grace and strength, concluding, “I am lucky to be fulfilled intellectually.” I truly value a character that is not unraveled when the things she assumed were certain are broken, but rather, remains rooted in her ideals and self-confidence. Isabelle Huppert as Nathalie, with Roman Kolinka as Fabien. There’s also something to be said about the teasingly-romantic, yet strictly platonic nature of Fabien and Nathalie’s relationship. I blame my Hollywood- accustomed mind once again for the half second where I hoped a romantic bond would develop between the two. Thankfully, I came to my senses and appreciated Fabien’s role in Nathalie’s new journey. It’s a friendship from one intellectual to another. More importantly, it’s a glimpse backwards for Nathalie, and a realization that she did not compromise her youthful ideas so much as matured into new ones. Mia Hansen-Love redefines mid-life crisis in Things to Come. Nathalie remains rooted as a woman of mind and heart, avoiding the chance to slip back into her youthful ways and moving forward not by refilling the things that are void, but by understanding this new phase as another chance to live freely and confidently. This French drama is lighthearted, thoughtful and surprising in a new way. Check out the official trailer and learn more about it on our press release. The film is showing at 7:30pm from March 27-April 1.